If you need a solution to hang some heavy-weighted curtains, we found 8 of the best heavy duty curtain rods on the market. These curtain rods are durable, made of quality materials and will be able to handle the weight of an elephant. Well, of course not, but, you get the idea. These picks for best heavy duty curtain rods are up for the task. And, in addition to choosing curtain rods that exude quality and durability, we also chose curtain rods with some heavy-duty mounting materials. Because, what good is a heavy duty curtain rod without a secure installment? Next, we wanted each one of these curtain rods to be expandable to accommodate any window setting. Therefore, we chose heavy duty curtain rods that are telescoping and adjustable. And, our next step when choosing the best heavy duty curtain rods was choosing rods based on design. Furthermore, we wanted a wide range of designs that could cater to just about every decor out there. So, whichever decor genre you fit into, you should be sure to find a heavy duty curtain rod that works for you. Our last step in finding the best heavy duty curtain rod was sifting through user reviews. And, in doing so, we got a first hand look at the longevity of a particular curtain rod. In addition, we were able to see how well these curtain rods held up due to the weight of the curtains. And, when searching for an outdoor pick, we got a first hand look to see how each particular outdoor curtain rod held up due to wind. Therefore, our final picks all have high marks in terms of durability. This first pick for best heavy duty curtain rods comes in three different sizes, spanning a measurement from 28 inches to 144 inches. And, this heavy duty curtain rod is telescoping, therefore, this makes it easy to achieve the precise measurement you need. The Ivilon Drapery Treatment Window Curtain Rod has a classic and traditional design which can outfit windows with a homey feel. And, this curtain rod features crown-style finials which give it a touch of elegance. This heavy duty curtain rod is made of durable metal which is 1 and 1/8-inch in diameter. And, mounting hardware comes included, which are the brackets, screws and anchors. Lastly, if you are looking for matching clip rings to hang your curtains, you can find those here. And, this company produces many different designs of heavy duty curtain rods which you can check out here. This is a heavy duty curtain rod, and as long as it is installed securely, this will accommodate a heavy curtain. Furthermore, the majority of consumers are thrilled with the sturdiness and the quality. Some consumers claim these curtain rods are hard to install. In addition, the finish on the rod may scratch easily. However, if you use high quality grommets and drapes, you shouldn’t run into this problem. This next pick is an adjustable telescopic curtain rod which is available in 2 sizes. Choose between 36 inches to 72 inches and 72 inches to 144 inches. Furthermore, it comes in your choice of 3 colors. Choose between Black, Bronze or Nickel. The AmazonBasics 1″ Curtain Rod with Round Finials is well-constructed and can hold up to 22 pounds of weight. And, this curtain rod and finials are made of quality metal to help support that weight. 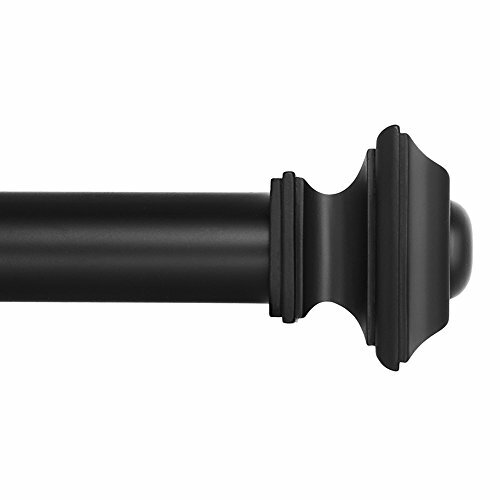 This heavy duty curtain rod measures 1 inch in diameter with large, round finials. 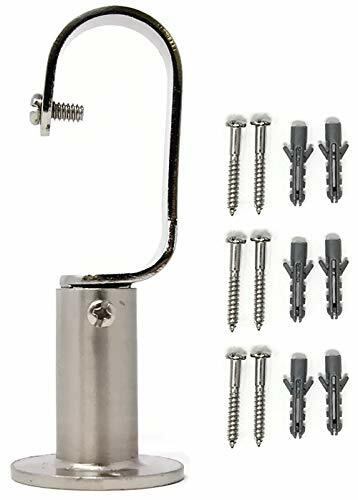 Lastly, this set up comes with mounting hardware which includes screws and anchors. And, of course, the handy installation instructions. Installation is very easy, with one consumer stating it took 5 minutes. Furthermore, consumers state this heavy duty curtain rod is extremely heavy duty. And, the quality is amazing. The finials are made of plastic. And, some consumers decided to purchase separate finials to finish installation. In addition, some consumers seem to think the finish of this curtain rod could be of better quality. If you’re looking to hang black out curtains or want to eliminate any light seeping through the sides of the curtain, this is a durable pick for you. The Urbanest Energy Saving Wraparound Black Out Rod Set will not only help to eliminate light, it will help to save on the heating bill and eliminate the sounds of that noisy neighbor. Sounds great, right? This pick for best heavy duty curtain rods is available in 6 sizes: 28 inches by 48 inches, , 32 inches by 52 inches, 48 inches by 84 inches, 52 inches by 96 inches, 84 inches by 120 inches, and 96 inches by 144 inches. 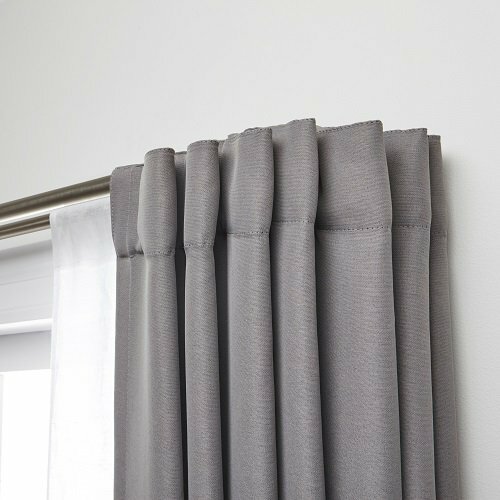 In addition, this curtain rod will project 4 inches from the wall and measures 1 inch in diameter to accommodate thicker curtains. The Urbanest Energy Saving Wraparound Black Out Rod Set is made of metal and comes in your choice of 5 different finishes. Choose between Brushed Steel, Antique Brass, Glossy White, Black and Bronze. Lastly, this heavy duty curtain rod is extendable to get the exact length you need. And, it comes with all the mounting hardware you need. This is a very sturdy curtain rod. And, it is energy-efficient which will save money over the long run. Furthermore, we love the flush look of the rod and the clean lines. Finally, this heavy duty curtain rod is easy to install. In order to attach the curtains, you will have to do this before the rod is installed. Therefore, if you want to take the curtains down, you may need to uninstall one side of the rod to slip them off. However, to prevent this, you could use hooks which will allow you to remove the curtains without taking down the rod. In addition, there is a seam on either end of the rod which is part of the adjustable feature. And, the curtains may get hung up on this particular seem. If you need an outdoor heavy duty curtain rod, this is a pick to consider. The Kenney KN90000 1″ Weaver Indoor/Outdoor Ceiling or Wall-Mount Window Curtain Rod is made of metal with a rust-resistant coating. This coating will help to protect the rod from less than desirable weather elements. 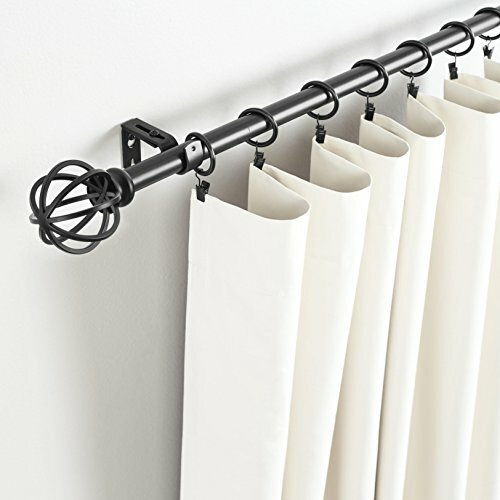 This pick for best heavy duty curtain rod can be hung from the ceiling or mounted on the wall. And, the ability to do this is included with the mounting hardware which comes with the curtain rod. The Kenney Weaver Indoor/Outdoor Window Curtain Rod is available in 2 sizes. Choose between 37 inches by 72 inches or 72 inches by 144 inches. And, this curtain rod is 1 inch in diameter. Furthermore, this curtain rod is adjustable to achieve the exact measurements you need in order to fit your window. Lastly, this heavy duty curtain rod is available in 2 colors: Black or Brushed Nickel. 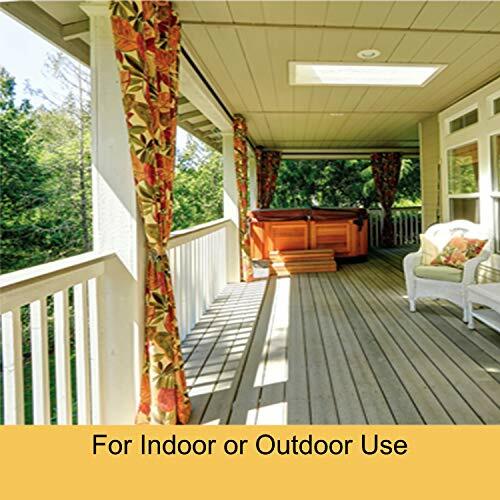 The majority of consumers state the Kenney Weaver Indoor/Outdoor Window Curtain Rod holds up well to weather elements which include the sun, rain and wind. Furthermore, most seem to agree, this heavy duty curtain rod is a good-looking rod for a great value. While the majority of consumers didn’t have an issue with the wind elements, a handful of consumers state the wind blew the rod and the end caps down. Furthermore, you will need to use all 3 brackets, including the middle bracket, to prevent this curtain rod from sagging in the middle. Fortunately, 3 brackets are included in the package. If you like to spice things up, the Sheffield Home Round Cage Curtain Rod may be that extra added decoration you’ve been looking for. This heavy duty curtain rod is available in 2 lengths: 36 inches by 66 inches and 66 inches by 120 inches. Furthermore, this rod is adjustable to fit the exact measurements you need. The Sheffield Home Round Cage Curtain Rod features 2 finials which detach to slip the curtains on and off. 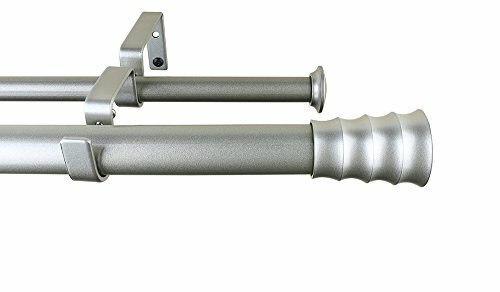 And, this heavy duty curtain rod comes with mounting hardware which includes screws, anchors and mounting brackets. Furthermore, it comes with an extra mounting bracket if you need to mount the center of the rod. 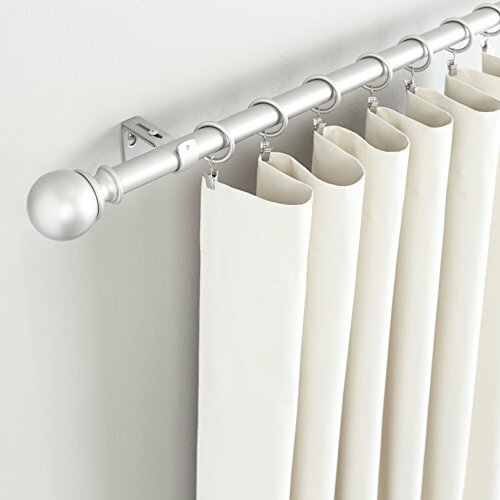 Lastly, this pick for best heavy duty curtain rods comes in your choice of 5 finishes. Choose between Matte Black, Oil Rubbed Bronze, Pewter, Satin Nickel or Silver. Most consumers claim these rods look great. And, many consumers state these rods are sturdy and made of quality. While many consumers are happy, there a some consumers who state this product is cheaply made. And, we at FHL are going to have to agree. After reviewing the product, it seems to us that these curtain rods can scratch rather easily and they are lightweight. While some consumers say these can hold a lot of weight, others didn’t quite agree. Therefore, personally, we wouldn’t chance it. A double rod is great if you’re looking to layer. And, for us, this works especially great when we want to pair a sheer curtain with a solid curtain. The Meriville Oakley Double Window Treatment Curtain Rod comes with 2 metal rods, with the thicker rod being 1 inch in diameter and the thinner rod being 5/8 inches in diameter. And, this rod is available in 3 lengths: 28 inches by 48 inches, 48 inches by 84 inches and 84 inches by 120 inches. Furthermore, this rod is telescoping, therefore, you can extend or retract this rod to your desired measurements. This pick for best heavy duty curtain rods comes with mounting hardware which include double brackets and finials. With the 28 inch by 48 inch curtain rod set you receive 2 brackets. And, with the other longer lengths you will receive 3 brackets. Finally, the Meriville Oakley Double Window Treatment Curtain Rod is available in 4 different finishes. Choose between Black, Oil Rubbed Bronze, Pewter and Satin Nickel. This heavy duty curtain rod is very sturdy and is up for the task of carrying the weight. Furthermore, they have a relatively minimal look, especially for being a double rod. While installation is rather easy, trying to drill a screw into this particular bracket is not. If you look at the way the bracket is shaped, you can clearly see why. In addition, if you will be using the center bracket, don’t expect the curtain to run the length of the rod. The way the bracket is set up, it’s just one blockade. And, our last pick for best heavy duty curtain rods is designed by Mauricio Affonso, a world-renowned designer who has won several international award competitions. And, this curtain rod is reflective of a modern and sleek design. The Umbra Twilight Double Curtain Rod Set is not only one in which you can layer, it is also an energy-efficient choice. Therefore, you can conserve heat by pulling the curtains around the edges. And, this tends to act like another layer of insulation. Furthermore, by pulling the curtains around the edges, you can eliminate the light which seeps in through the sides. Additionally, this also will help reduce outside noises from peeping through. The Umbra Twilight Double Curtain Rod Set comes in your choice of 3 sizes. Choose between 28 inches by 48 inches, 48 inches by 88 inches and 88 inches by 144 inches. And, this curtain rod is adjustable, therefore, you can achieve your exact measurements. Furthermore, the front rod measures 3/4 inch in diameter, while the back rod measures 5/8 inch in diameter. This heavy duty curtain rod set is made of high quality metal and comes in your choice of two finishes. Choose between Matte Nickel or Auburn Bronze. Lastly, the Umbra Twilight Double Curtain Rod Set comes with all the wall mounting materials needed to secure the rod to the wall. This includes rod brackets, screws, drywall anchors, and, of course, instructions. And, once installed, this rod will hold a maximum weight of a whopping 22 pounds. We love the simpleness of the design. Furthermore, the design is such that it will hold the weight and hold it well. In addition, this curtain rod is made of high quality materials and durable construction. Lastly, with this pick you get a 2-in-1. You get all the advantages of a blackout curtain rod and the advantages of layering your curtains. Some consumers have stated the anchors included are rather cheaply made. Therefore, you may need to purchase these separately to get a secure installation.